Serving Beaufort County including the city of Beaufort and Bluffton. Sea Spray is an online service provider as defined in the Digital Millennium Copyright Act. We provide legal copyright owners with the ability to self-publish on the internet by uploading, storing and displaying various media utilizing our services. We do not monitor, screen or otherwise review the media which is uploaded to our servers by users of the service. We take copyright violation very seriously and will vigorously protect the rights of legal copyright owners. If you are the copyright owner of content which appears on The Sea Spray website and you did not authorize the use of the content you must notify Sea Spray in writing in order for us to identify the allegedly infringing content and take action. to locate the material. You should include the specific URL or URLs of the web pages where the allegedly infringing material is located. Information reasonably sufficient to allow The Sea Spray to contact the complaining party which may include a name, address, telephone number and electronic mail address at which the complaining party may be contacted. We are professional, dependable and efficient in all aspects of our business. “Our goal is to ensure that you, the customer, are satisfied with our service. We strive to build long term relationships with our clients. 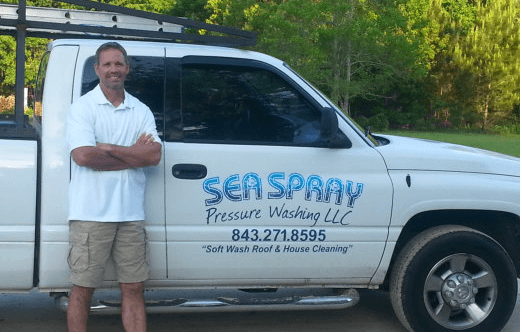 Feel free to call us with all of your exterior cleaning needs.” Dave Corneliussen – Owner/Operator Sea Spray offers a variety of services designed to dramatically enhance the appearance of both residential and commercial properties. Before initiating work, our professionals will discuss your requirements and offer customized pressure washing or soft clean services for the best outcome. Get A Quote From the Best Cleaners Licensed and Insured Serving Beaufort County including the city of Beaufort and Bluffton.